We have very few in stock. Will show out of stock once these have been purchased. 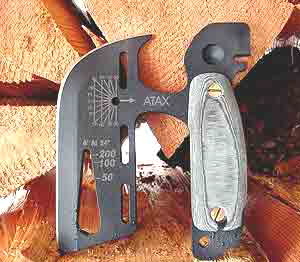 WHAT'S INCLUDED: ATAX TOOL. MADE of 1095 STEEL. INSTRUCTIONAL DVD. Please note: We do NOT include a survival kit with this item. In the instructional DVD Ron shows you that the handles are hollow and that they can hold a small survival kit. The survival kit itself is not included with this purchase. Foreign ORDERS: Please note: If you are ordering this to a destination outside the USA additional shipping may apply and we will contact you about this. Also please check with your country's customs regarding blades. If a blade is confiscated by Customs for some reason we do NOT offer refunds for this item because they do NOT send it back to us and therefore we can not resell it.